Alex and I love our runcations. Usually it’s a half marathon that draws us on a European getaway, but for this holiday (technically an anniversary even though we forgot about it until 3pm and ended up having Gyros and table wine as a celebration) we wanted sun & sights. 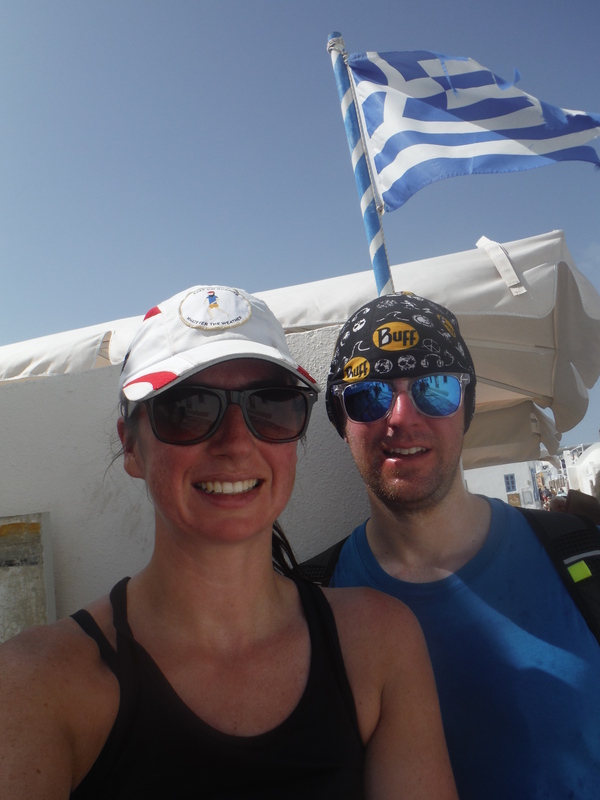 We decided on Santorini for 5 days and when I put the trip in my diary I noticed it was over one of the last “big” training weeks of my Dublin Marathon training plan. There was a glaring 20 mile run scheduled to take place on a volcano which is only 11 miles long. 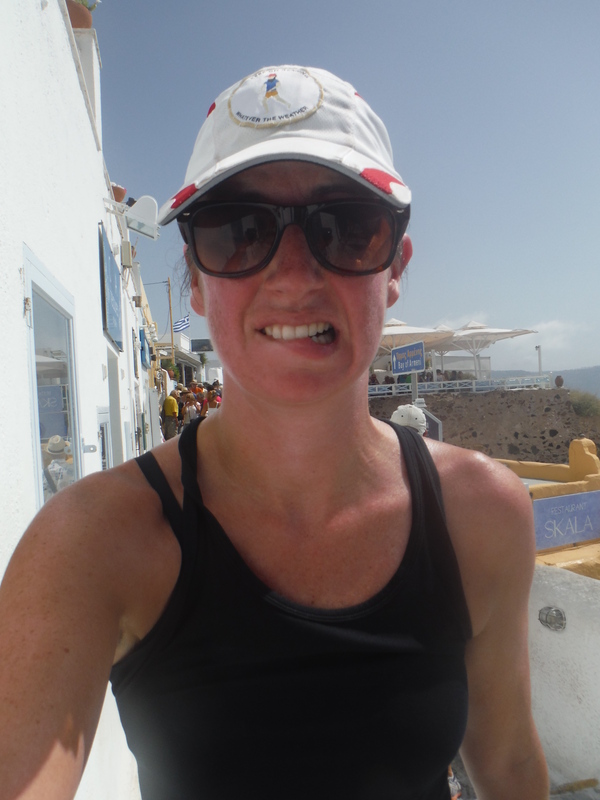 Not one to let my marathon training get in the way of life, I didn’t worry about the actual amount of miles but thought how I could fit a run of any size into our holiday. 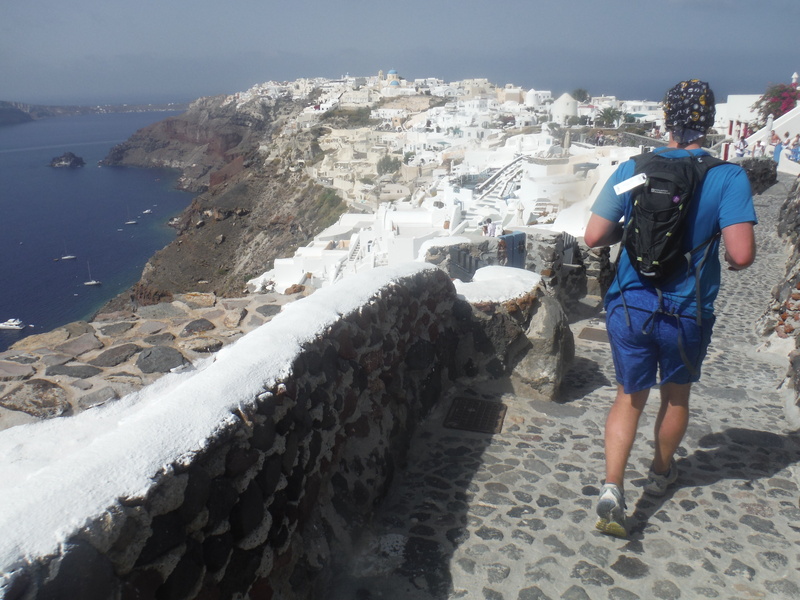 Googling told me there was a great hiking path from Fira – Oia that was about 6 miles, and then this guy who ran the whole Island but on roads which I wasn’t keen to do. 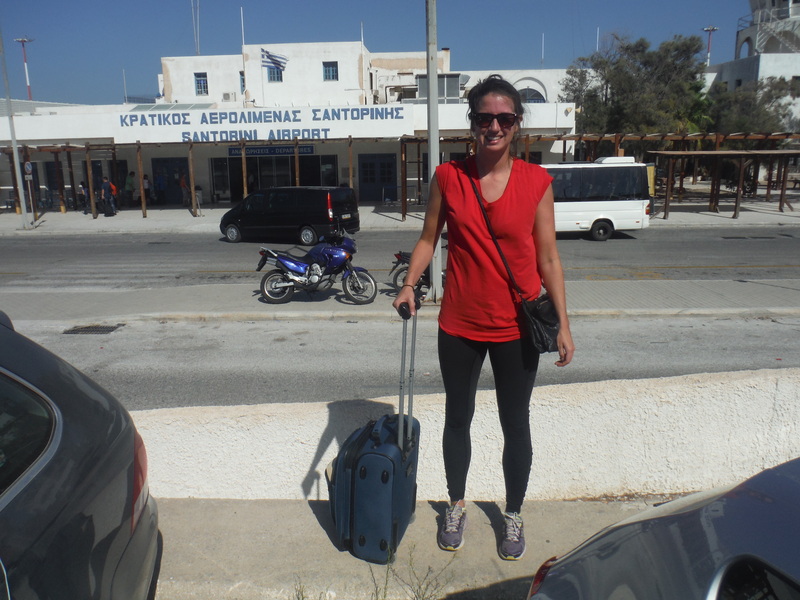 Not very scenic and not very safe (do not trust a tourist on an ATV ever). 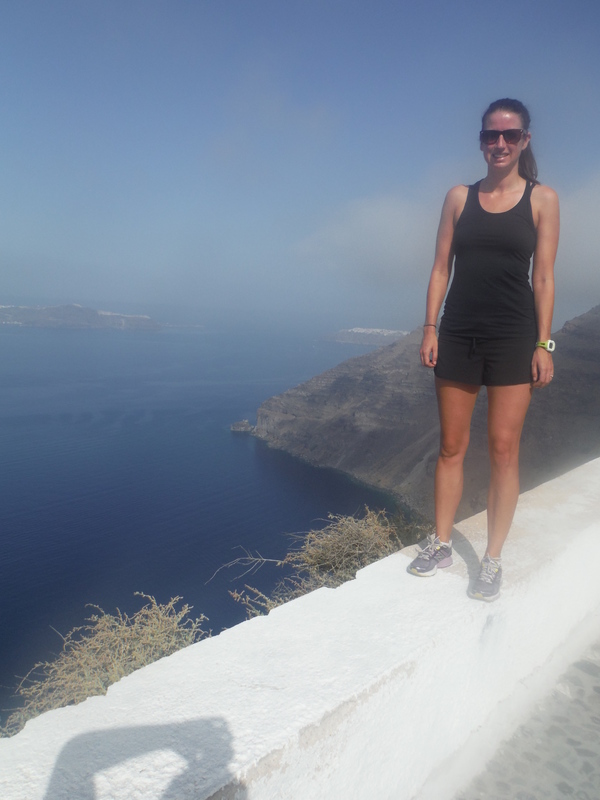 We were staying in Oia so I had a tentative plan to ask around on our first few days for the best running routes. 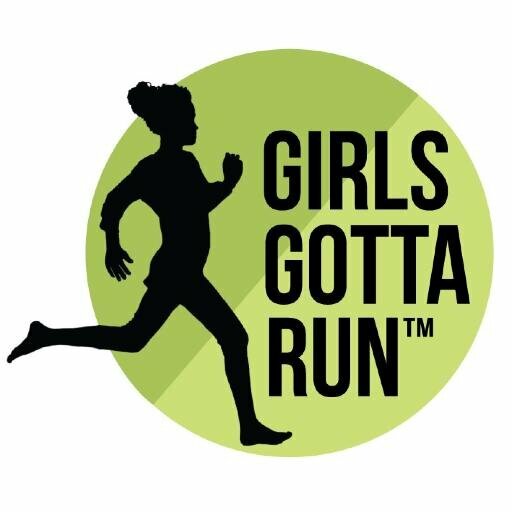 When we arrived at our hotel the staff were lovely and helpful if not shocked when we asked for the best running routes around. 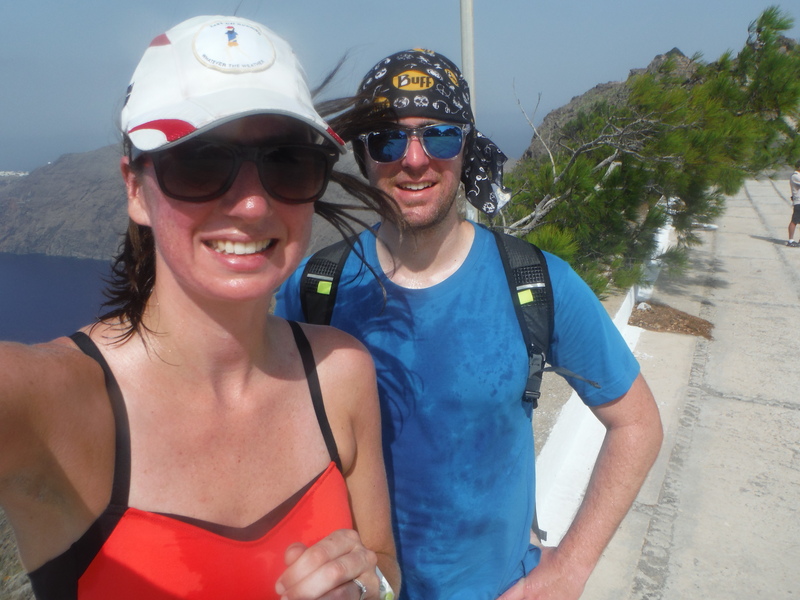 Over a few beers we determined it was possible to run the trail and best to run from Fira to Oia as the views were better and the hills weren’t as steep. 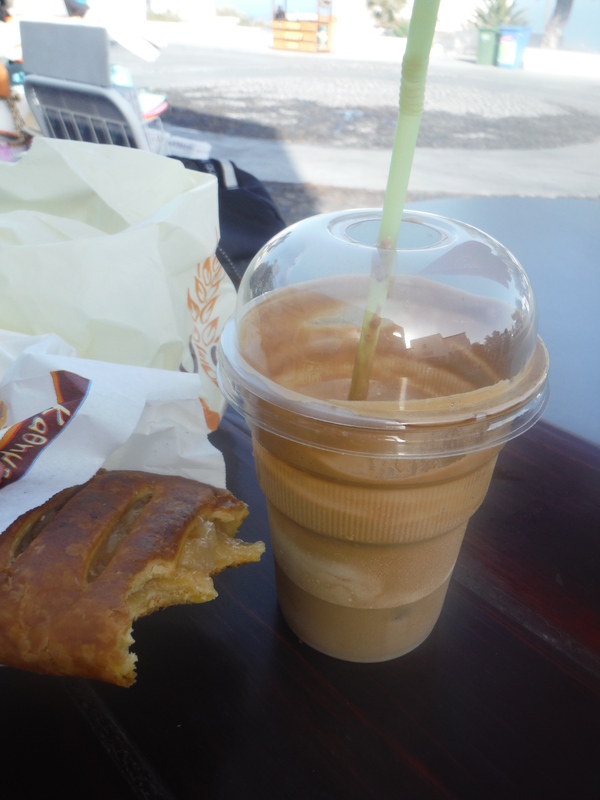 The next morning we got up with the sun and stopped at the bakery for some fuel (apple pastry & Nescafe frappes are recommended) and caught the bus from Oia to Fira. 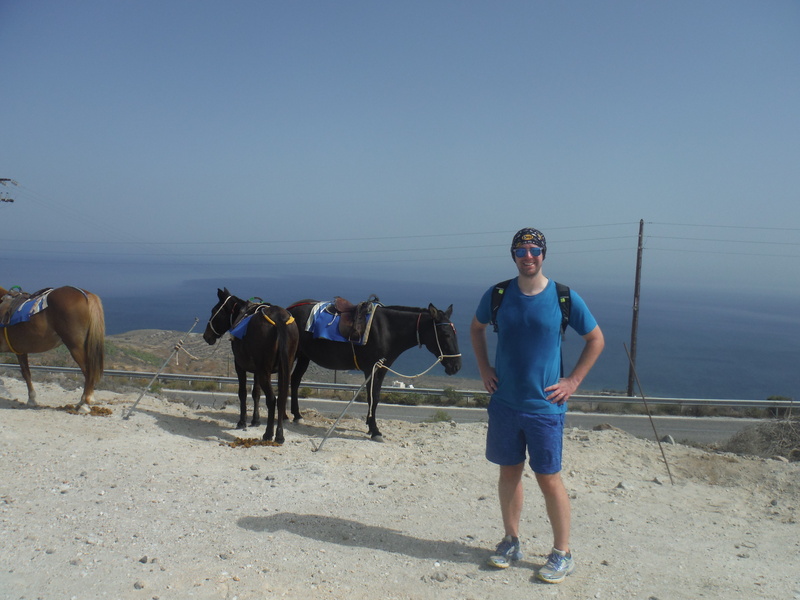 The local busses are great on Santorini, they run every 15 minutes and I think it cost us €3.20 for the trip. The bus wasn’t too busy being early and shoulder season, but in the summer be ready to wait for a few or fight your way on. 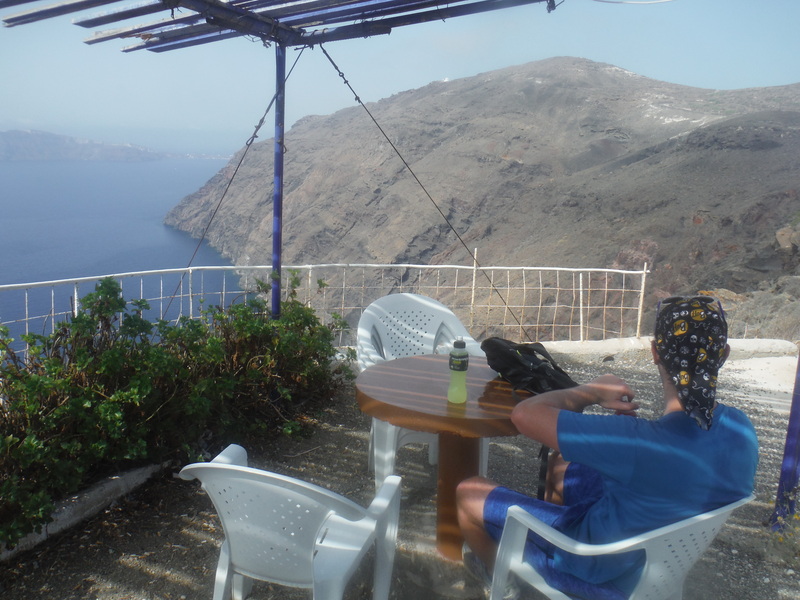 We arrived in Fira and walked straight up from the bus station towards the Caldera and then at the really nice hotel turn right. From the various hiking reviews and tips we received our directions back to Oia were, “keep the Caldera on your left, try not to go downhill, and if in doubt turn left” It seemed pretty hard to get lost as even from the first minute we could see the Oia end of the island in the distance. We brought water with us, but with the temperature already at 25*C we loaded up with a couple extra bottles. 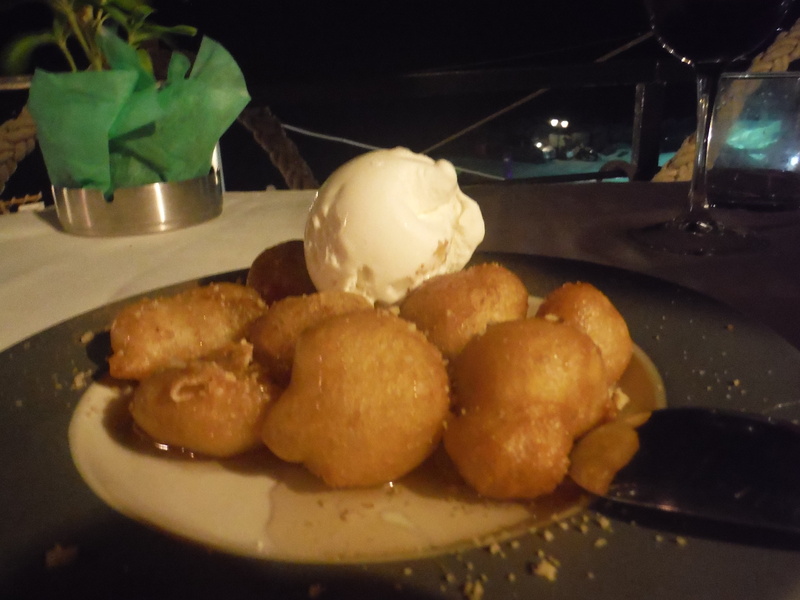 At the Fira cable car we started our run… with a walk. 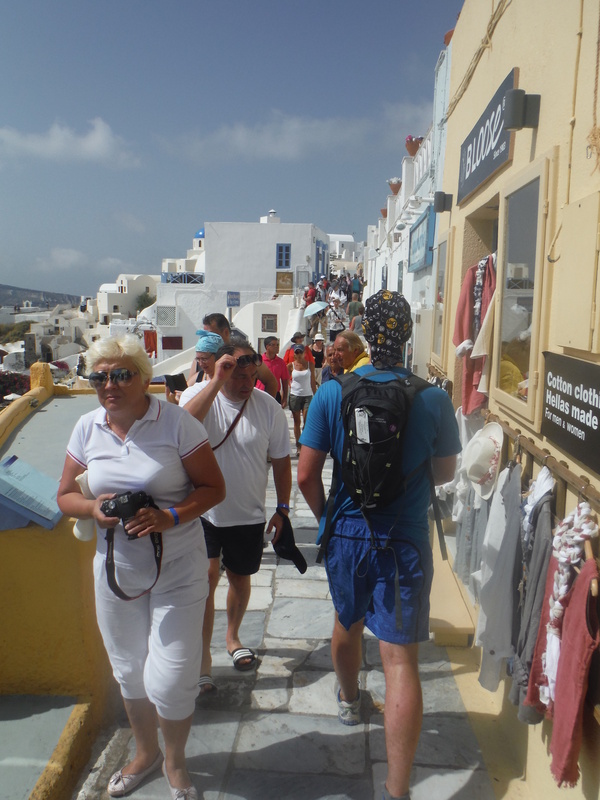 Even at 8:30am it was packed with tourists coming up from the cruise ships, so we kept on walking. 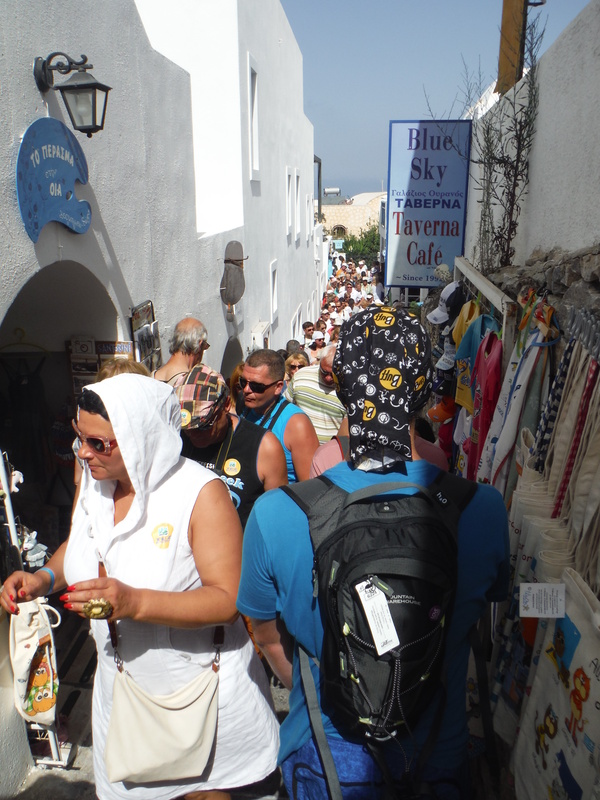 The path is really easy to follow through Fira and Firastefani with lots of lovely shops & beautiful hotels to pass as you question if you’re ever going to hit an actual trail. 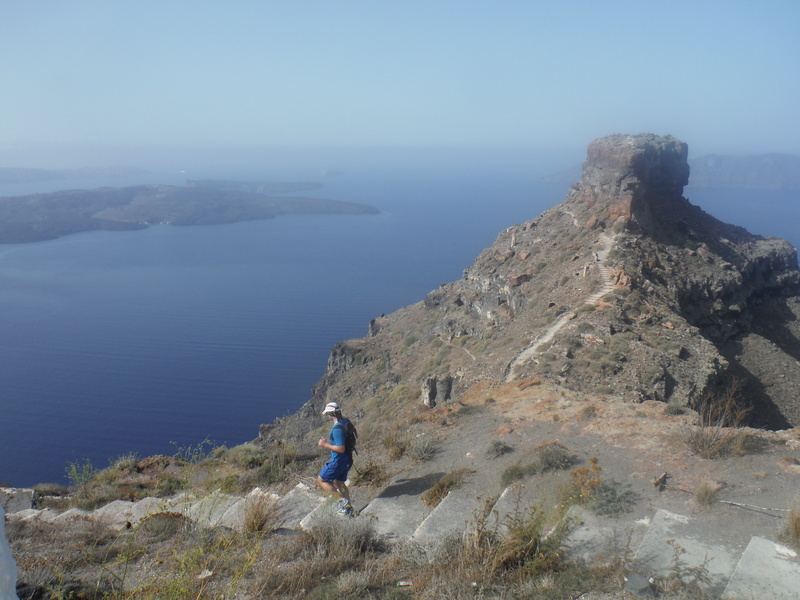 It’s really beautiful though and totally a part of running on Santorini! 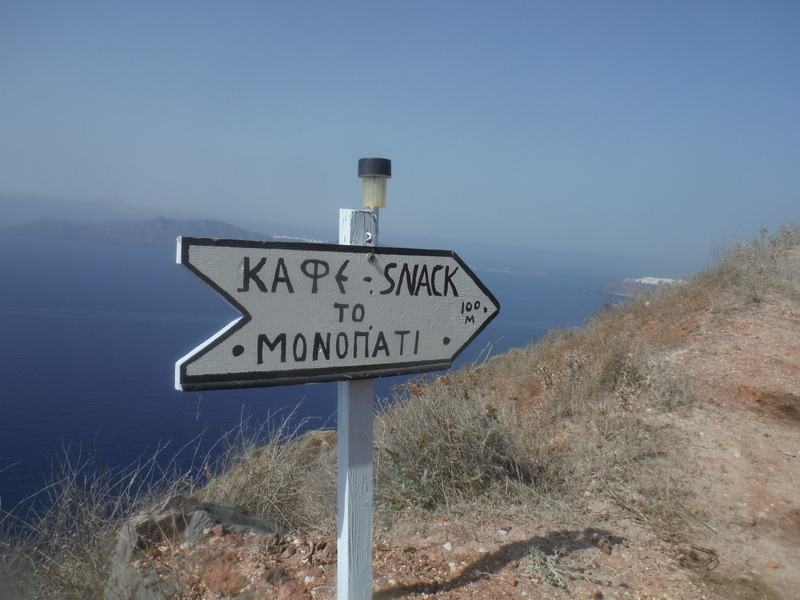 We quickly reached Imerovigli and looked to the left to see a path leading to Skaros rock. We didn’t even hesitate to run down (and up again) to check it out. It was a great detour to take as it provided great views of the whole caldera and provided some needed shade during our water break. 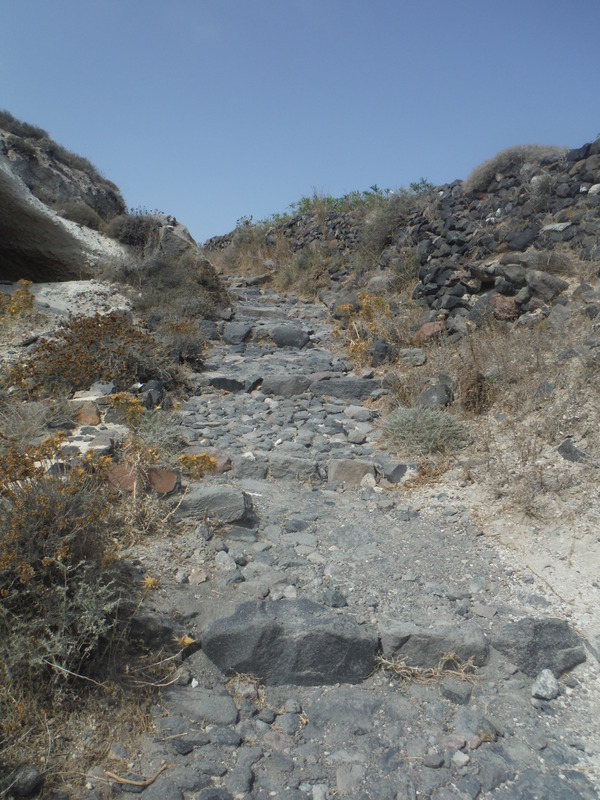 It kinda goes without saying that there are a lot of steep hills on Santorini. We weren’t trying to set any records, and if anything increase our “time on feet” during the run so did a lot of walk/run up parts of the path like this. Obviously the run was beautiful, but when you’re out running and look to the left to see a scene like this one below, you have a little moment of second guessing your crazy running lifestyle. We got a lot of looks from those just waking up for their pool-side breakfasts and almost jumped in a few of the trail side pools. Continuing through Imerovigli the trail got a little less populated and just a little more flat. Alex and I talked about how on earth people run in heat double this in multi-stage desert races, as being more than 15 minutes from a pool made us feel weary. We were obviously running with no music so it was funny to hear the comments of people we passed on the trail. I don’t think trail running was an option on their daily cruise options. We were drinking loads of water and sweating it all out. So at about 3 miles in we saw this welcome sign. There are quite a few snack/water places along the trail, but I would recommend bringing enough to sustain you for a 2 hour run if you are going on this route. We were slightly sweaty when we stopped for 2 of the most expensive-but-needed Gatorades ever at €3.50 each! But you pay for the views – a quick break to cool off out of the sun and we were just over half way. After the snack stop was one of the most fun parts of the trail as it winded around the mountain and was a soft surface (most is quite cobbly/rocky) so you could really let your legs go. After this trail you descend back to the main road and have to actually run ON the road (no sidewalk) for a few hundred metres. Just keep an eye out for those pesky ATVs and soon enough you’re back on the clearly marked path running past the Donkeys. It was much to hot for a top and as we made it to the peak of the second to last hill we took a few moments to enjoy the seabreeze. *Note* the sweaty pony tail. It was so warm my ponytail was picking up my neck sweat and by the end of the run my hair was soaked through. 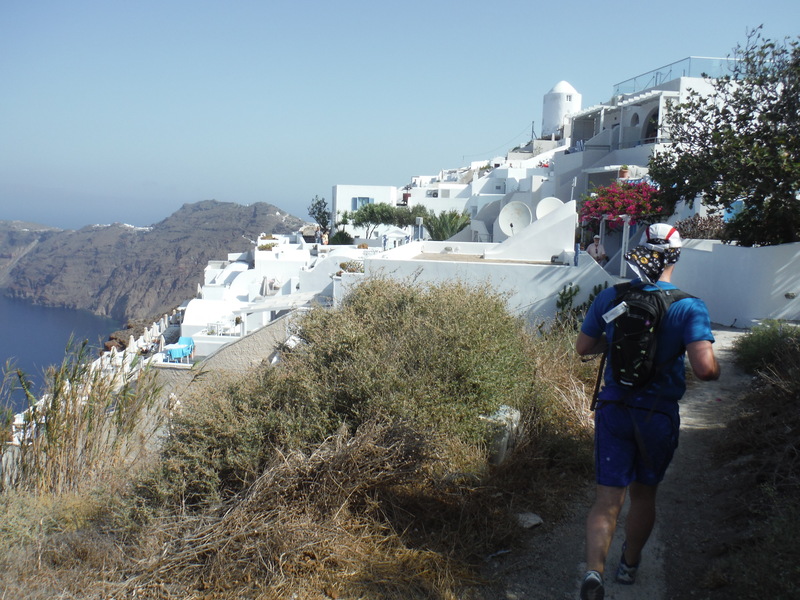 After a short downhill it was back uphill to the last peak and the church that overlooks Oia. 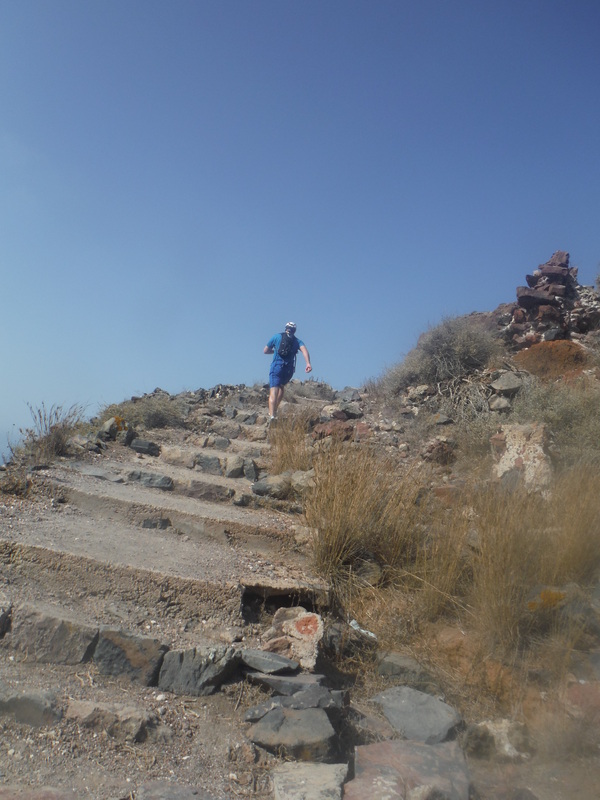 Lots of rocky stairs to go up that made my ankles work harder than ever. Once you reach the “third chapel” you can see the town of Oia below and it’s a very quick (especially if there is a gyro & a pool waiting!) jog down. 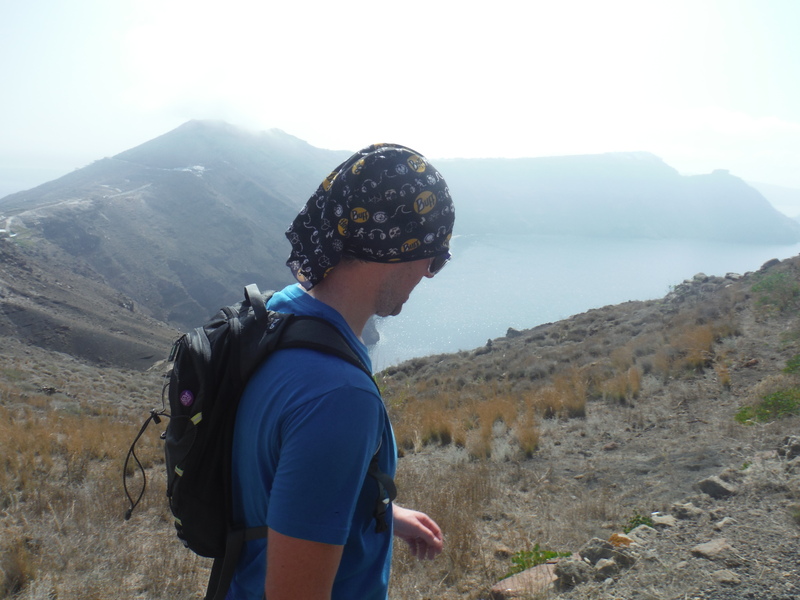 I don’t usually recommend looking behind you when running but it was cool to take a few moments to look back and see the route along the caldera which we had just run! 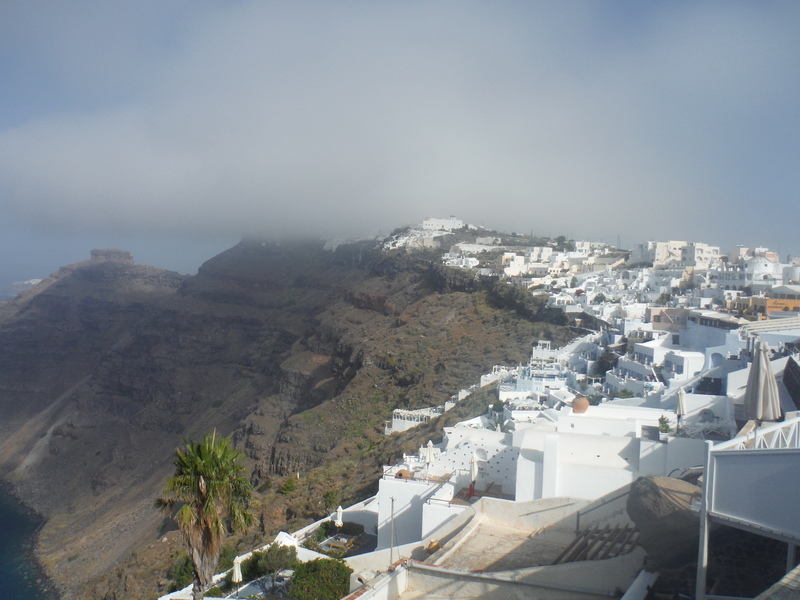 It was coming up on 11:30am when we reached Oia and the town was packed already. A quick flag selfie and we tried to keep running to our hotel but it was more like the London marathon than trail running at this point. We arrived back at our hotel and immediately jumped into the pool to cool down and get some of the layers of dust off our bodies. 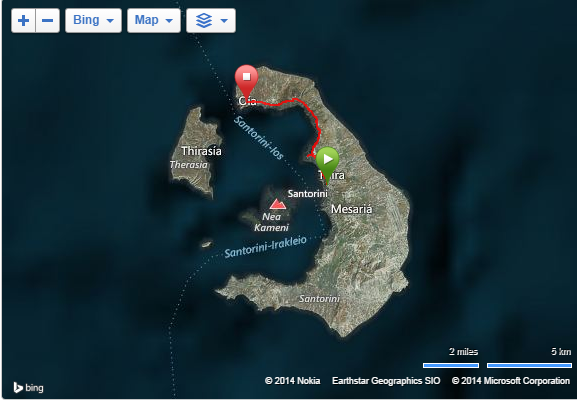 Half an island run – all in a mornings work. 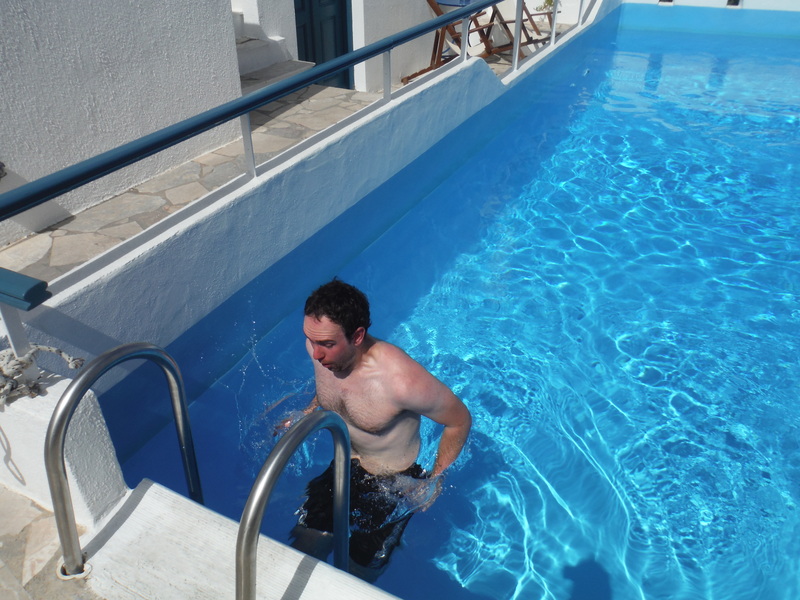 Suitably recovered, we spent the rest of the day smugly sitting by the pool drinking Mythos beers and inhaling gyros. 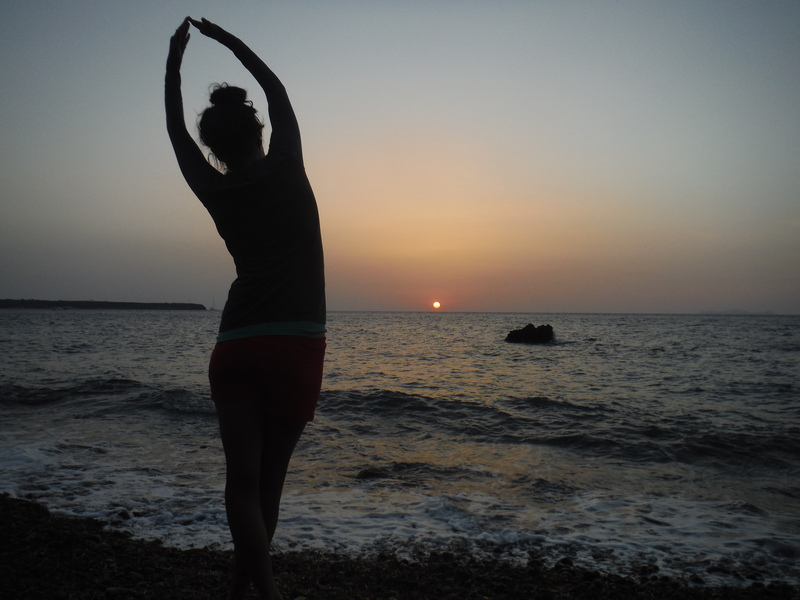 Recharged, we headed down to the ocean for a sunset swim, stretch & greek doughnut reward. 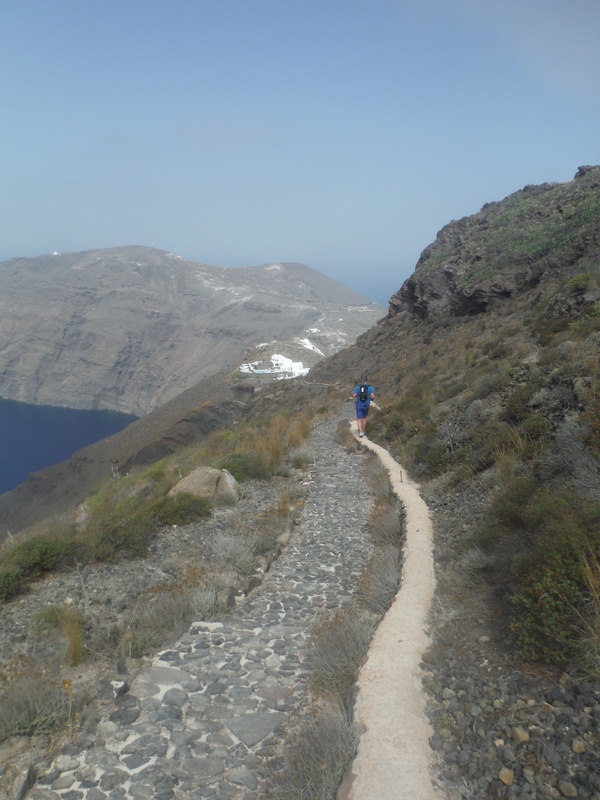 If you’re looking to run during your holiday on Santorini I highly recommend the Fira – Oia trail. 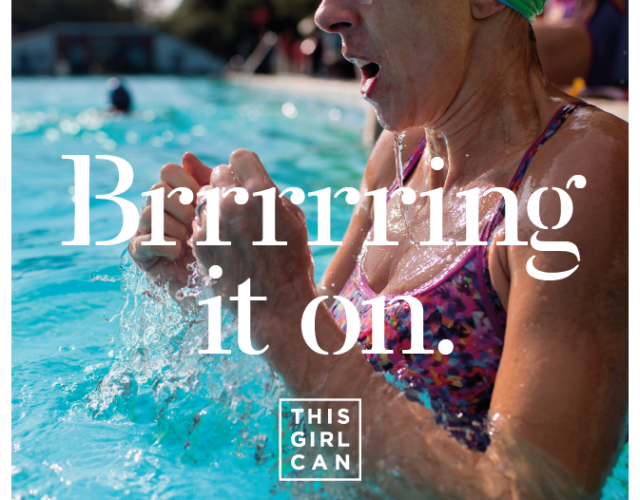 Bring a hat, sunglasses, lots of waterproof sunscreen, and more water than a camel. This entry was posted in london on October 6, 2014 by lauraestewart. 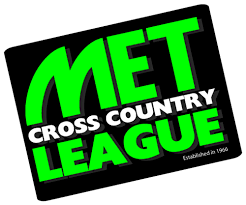 I might be headed here this year! Roughly how far is that? 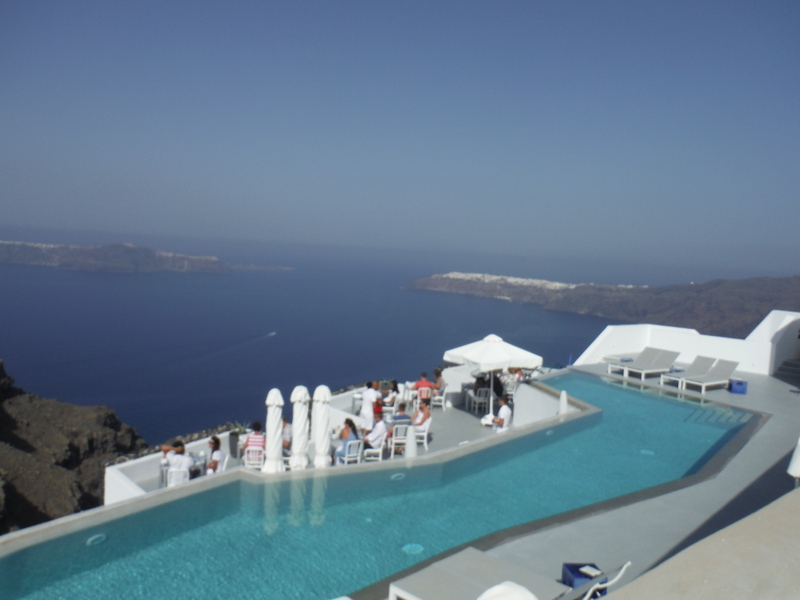 Any hotel you would recommend in Santorini?